Updated Wednesday May 23, 2018 by Heather MacNeil. 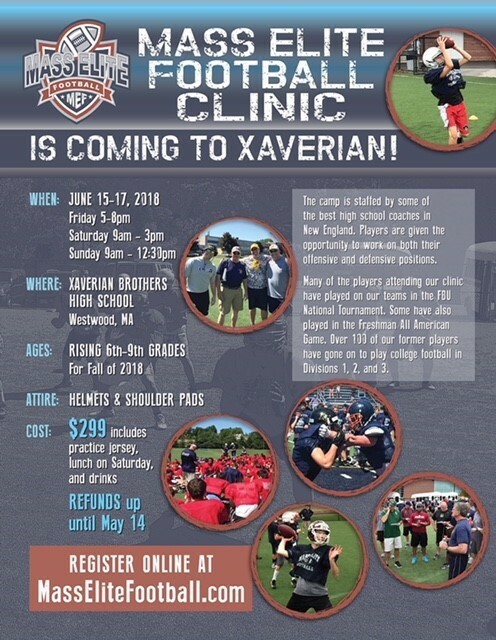 Please see the brochure for the Mass-Elite Football Camp at Xaverian Brothers High School in Norwood from June 15th through June 17th. This is an excellent camp for kids from 6th grade through 9th grade and the level of coaching is outstanding (mostly because Tom Porell be one of the coaches #shamelessplug. Please feel free to pass this along to any kids who would be interest in attending this camp.